The Marietta Award Program names Coast Dental Marietta Trade Center the winner of the “Best of Marietta” award in the General Dentistry category. 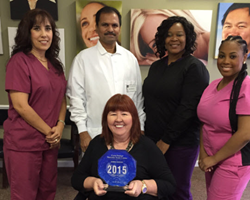 The Coast Dental Marietta Trade Center team received the "2015 Best of Marietta" award in the General Dentistry category. We love helping the people in the Marietta community smile, and it's very gratifying to be rewarded in this way. Coast Dental Marietta Trade Center is the proud recipient of the “2015 Best of Marietta” award in the General Dentistry category. The honor was bestowed by the Marietta Award Program in September. Coast Dental Marietta Trade Center offers preventive and restorative general dentistry services such as exams and cleanings, fillings, crowns, bridges, partial dentures and complete dentures, dental implant restorations, and pain relief. It also offers cosmetic dentistry services including teeth whitening. The Coast Dental team also strives to provide same-day emergency dental appointments. The dental office is located at 270 Cobb Parkway South in Marietta, GA 30060. The phone number is (770) 425-6333. Marietta dentist Dr. Anil Kudumula believes a visit to the dentist office should be as pleasant and stress-free as possible. He listens to his patients and creates a treatment plan tailored to each one’s specific needs. He treats adults, teenagers, and children as young as five years old. Dr. Kudumula earned his Doctor of Dental Surgery (DDS) degree from New York University College of Dentistry in 2006. He is a member of the American Dental Association, Georgia Dental Association, and the Academy of General Dentistry and is fluent in English, Hindi, and Telugu. Each year, the Marietta Award Program identifies companies it believes has enhanced the positive image of small businesses through services to their customers and their community. Various sources of information were gathered and analyzed to choose the winners in each category. The winners were determined based on information gathered both internally by the Marietta Award Program and data provided by third parties. Coast Dental of Georgia, P.C., with its affiliated professional associations, is one of the largest providers of general and specialty care in the United States with affiliated practices operating as Coast Dental and SmileCare in Florida, Georgia, California, Nevada and Texas. Coast Dental Services, LLC is a privately-held practice management company that provides comprehensive, non-clinical business and administrative services to its affiliated practices. The company is headquartered in Tampa, Florida. For more information, visit CoastDental.com.